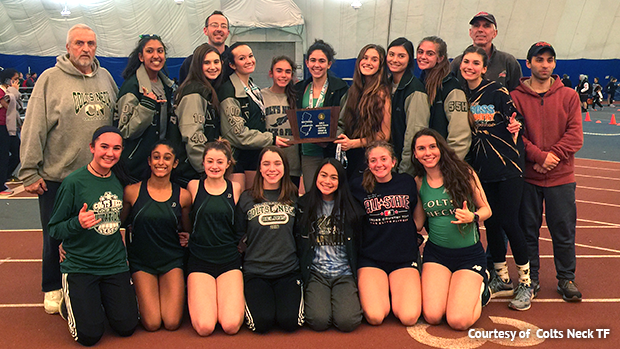 The Colts Neck girls won their first title at indoor Sectionals with a score of 49 to 44 over West Windsor-Plainsboro North. North didn't go home empty handed though as the boys won their third straight and fifth title overall. A lot of Colts Neck's strength came during the distance focused events where they totaled 31 points. Freshman Lilly Shapiro made her presence felt with a 2:17.59 NJ#4 victory in the 800m, her best coming in was 2:20.9! Also in that race was Arianna Sakoutis in fourth at 2:21.29. During the 1600, Delia Russo ran 5:19 for third and Colleen Megerle 5:24 for sixth. The 3200m once again saw Russo now fourth at 11:37 and her teammate Natalie Shapiro third at 11:28. In the pole vault Camryn McCloskey gathered eight points with her second place 10-06 clearance. Sasha Lerner sprinted to fourth in the 55 dash running 7.58 and their 4x400m team closed the meet to clinch the team victory with third place running 4:10.83. 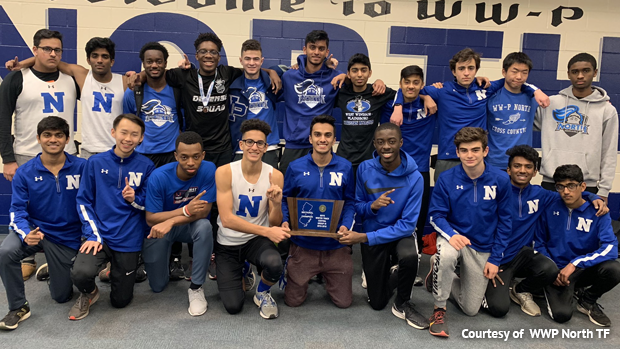 West Windsor Plainsboro North scored in nine of ten events, and of those nine they had more than one scorer in six of them! During the 3200m Ashrrith Rachakunta and Jeffrey Chen went 2-3 running 9:52.65 and 9:58.37. They saw another 2-3 finish during the 400m dash when Ahmed Elmogi and Desmond Patterson ran 51.97 and 52.12, Myles Williamson also securing two points in fifth with 52.25. The 1600m had Luke Johnson third and Yesh Srivistava fourth running 4:33 and 4:36. Srivistava also placed third in the 800m run at 2:02, teammate Ryan Boev fifth 2:04. In the 55m dash and hurdles Dede Smith finished third in the dash at 6.62 and Myles Williamson fifth in the hurdles 6.62. It wasn't just on the track though, their vaulter Mikey Redavid claimed fourth place with his 10-0 season best clearance and Nick Vergara hit a mark of 44-05 to finish third in the shot put. The team closed the meet out with a fourth place finish in the 4x400m running 3:38.18. 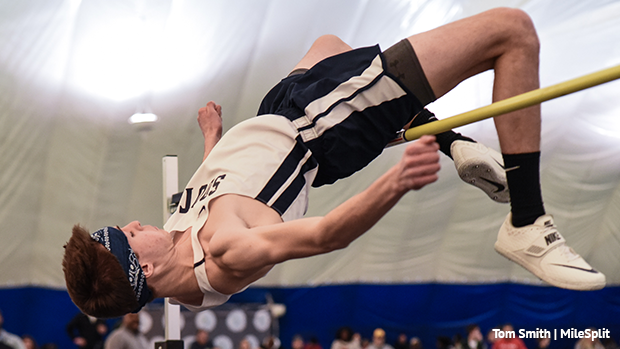 Other highlights from the meet... Mark Anselmi of Middletown South cleared 6-05 for the win and had solid attempts though just missed at 6-08.25. Liam Murphy was a double winner taking home the 1600m and 3200m with times of 4:25.27 and 9:26.86. Louis Akpadago of Hamilton North won the 55m dash running 6.42, also hit that time in prelims, and his teammate Alix Oge found gold in the 55m hurdles at 7.59. Freshman Shamali Whittle of Hamilton North second in that hurdle race as well at 7.62. Hamilton East senior Terris Burton won the 400m clocked in at 51.32. Middletown North's Anthony Sclafani outlasted Mike Heinz of Allentown to win the 800m 2:01.21 to 2:01.48. Woodbridge won the 4x400m at 3:34.28. Brick Township's Anton Svirskyi vaulted 12-00 to win the pole vault. Red Bank Regional went 1-2 in the shot put with Brendan Loftus 53-10 and Ryan McCarthy 46-04. On the girls side Catherine Wimmer of Red Bank Regional won two events running 5:10 in the 1600m and 11:04 in the 3200m, her teammate Maggie Cahill won the 55m dash at 7.30. Trinity Eason of Woodbridge the 400m winner with 58.71. Middletown North junior Katelyn Reid the 55m hurdles at 8.56. Brick Memorial had a 1-2-3 sweep in the high jump thanks to sophomores Gabriella Argondizza, 5-00, and Kailyn Kelly, 4-10, as well as junior Caitlin Salvia, 4-10. Northern Burlington's Lindsey Michie cleared 10-06 to win the pole vault. Burlington Twp went 1-2 in the shot put off the Zhanye Vines and Gianna Abbruzzese's marks of 36-00 and 33-06.5.